You can assist in a survey for the development of a Regional Food System that will support the production, distribution and sale of local food for local consumption. The outcomes of the survey will help support our local farmers, provide healthy, fresh, seasonal, regional food to our local community and create authentic local tourism experiences that will have visitors raving about the amazing food offering experienced in Tropical North Queensland. There are four different surveys for; Local residents, Local food producers, Tourism and Hospitality businesses, and Visitors. Craig Squire won the award for his Tempura bugs, papaya salad, with sweet chilli lemon myrtle dipping sauce. 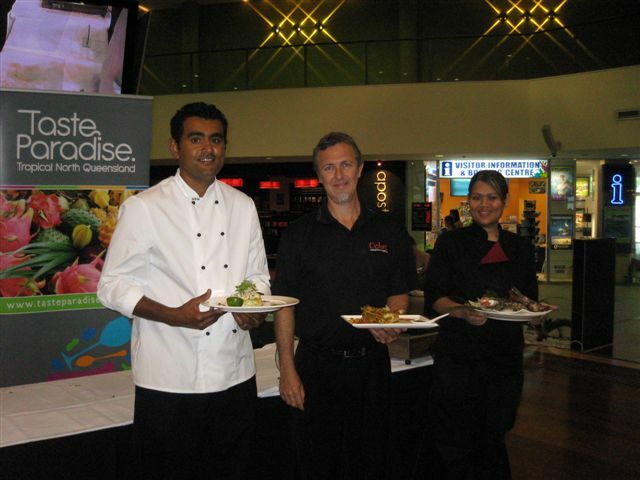 Three innovative finalist dishes were cooked off in front of the public and a panel of judges at the Pier at the Marina on Saturday 13th November, to declare the winning dish that was considered the essence of Tropical North Queensland, on the presentation and how innovatively the chef has used local regional produce so that every mouthful says ‘Taste Paradise’. What do you get when you mix Queensland’s finest regional produce, a splash of wine, some passionate producers and one very excitable chef in a television series? The result is Off the Eaten Track – a collaboration between the Department of Employment, Economic Development and Innovation (DEEDI) and Tourism Queensland, to air on Saturday 4 December at 7pm on Channel 7. in the lead up to Christmas.Minister for Primary Industries, Fisheries and Rural and Regional Queensland Tim Mulherin said the series was a celebration of the people who grow, catch and make Queensland produce. From iconic Queensland mud crabs and mangoes to the more exotic avocado ice-cream and Australian Desert Limes, Off the Eaten Track will tantalize your taste buds. 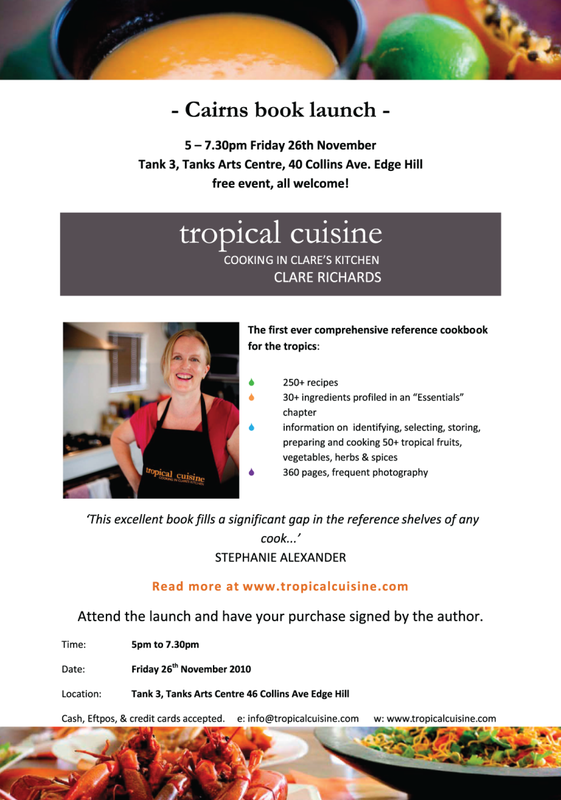 Celebrate a feast of Atherton Tableland coffee, Chinchilla’s Murray cod, Rockhampton’s beef, Hervey Bay’s scallops, Ayr’s exotic achachas and buffalo mozzarella from Cairns. “While Off the Eaten Track showcases how regional produce can be prepared, it is not just about cooking or travel – it is a revealing and entertaining exposé of the high-quality produce that comes from our state,” he said. “Queensland has an increasing reputation both domestically and internationally for high quality fresh produce and wine and this series will help build it further. This session will demystify the myths and clarify the terms generally used in relation to online businesses. From differentiating between business and domain names, email and web hosting, to the dos and don’ts of being online, this session will help you choose the right tool for the job. session will work through identifying a clear, comprehensive, strategic implementation plan. By identifying your key business needs to succeed and incorporating them with your online strategy, you are better prepared for a more effective online presence. Understand how having an online strategy can create an active marketing channel for your business and how this can help to achieve your business goal. This session will review the content covered in the previous three workshops. Attendees will be provided with a workbook to help prepare for the further advance with their online business. This session will have all three presenters available to address any questions. 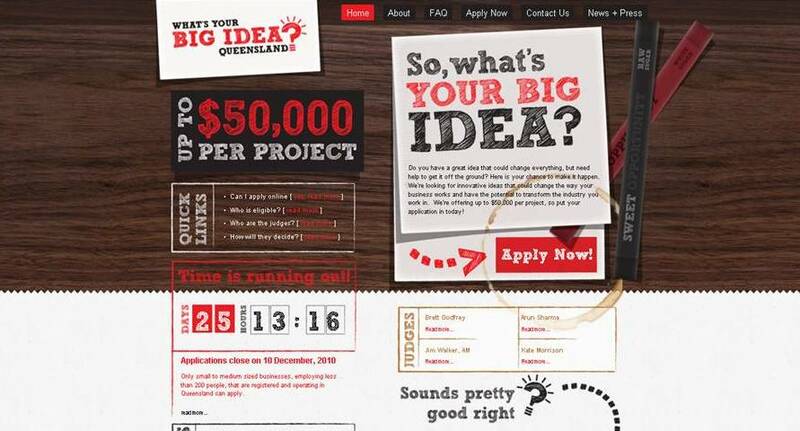 Do you have a great idea that could change everything, but need help to get it off the ground? Here is your chance to make it happen. We’re looking for innovative ideas that could change the way your business works and have the potential to transform the industry you work in. We’re offering up to $50,000 per project, so put your application in today! 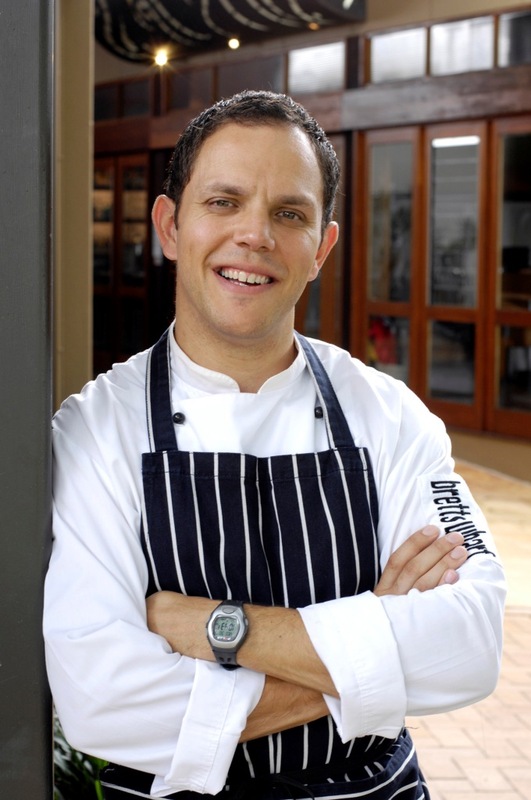 Posted in ATF HOT NEWS, Chef's Corner | Comments Off on Do you have a BIG Idea? The Australian Competition and Consumer Commission (ACCC) has instituted proceedings against four cafés and restaurants for alleged breaches of the component pricing law by failing to include Sunday and/or public holiday surcharges in their menu prices. The ACCC has produced specific guidance for restaurants, hotels and cafes to explain their obligations under section 53C of the Trade Practices Act 1974 and has been working with relevant industry bodies to ensure that information reaches their members. As part of its continuing education campaign, the ACCC recently wrote to a number of state and national industry bodies to remind them, and their members, of the requirements of section 53C ahead of the coming September and October public holidays. 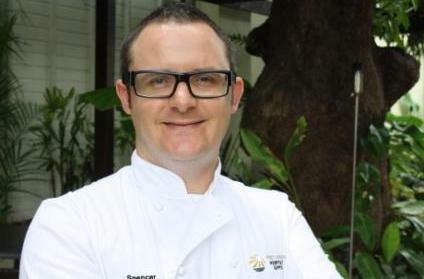 Congratulations to Spencer Patrick and his team at Harrison’s Restaurant & Bar in Port Douglas who won the Queensland State Savour Australia Restaurant & Catering Awards for Excellence, for the best New Restaurant that was announced on Monday 13 September at the Brisbane Convention & Exhibition Centre. Launch of the fourth edition of the “Training of Young Professionals in Spanish Gastronomy 2011” program. The Training of Young Professionals in Spanish Gastronomy Program was created in 2007 by the Spanish Institute for Foreign Trade (ICEX) in response to the growing international influence of Spanish cuisine that, in recent years, has become a leader for creativity and innovation in culinary techniques, raising awareness of the huge diversity and quality of Spain’s most emblematic products. – Stage One: participants receive an intensive course in the Spanish language lasting four weeks and a three-week training period of immersion in Spanish culture, gastronomic history and products. – Stage Two: this involves a stay at an internationally renowned restaurant with a prestigious reputation for a period of six months. In the 2009 program, some 22 restaurants participated (El Bulli, Arzak, El Celler de Can Roca, Martín Berasategui, Akelarre, Mugaritz, El Poblet, Adolfo, Calima, Santo Mauro, Echaurren, Abac, Oriol Balaguer, La Terraza del Casino, Café de París, Las Rejas, Alkimia, Casa Gerardo, Guggenheim and El Chaflán). – Stage Three: the training program finishes with a competition in which the young chefs demonstrate the knowledge they have acquired in Spanish cooking and ingredients. Young professionals from Germany, France, Norway, Sweden, Finland, Denmark, Iceland, Switzerland, United Kingdom, Russia, USA, Canada, Brazil, Mexico, Australia, New Zealand, China-Hong-Kong, United Arab Emirates, India, Singapore and Japan, although applications from candidates in other countries will also be considered on an individual basis. – To have completed at least the first three courses at a culinary college of recognized status or to have experience in well-known restaurants in the candidate’s country of origin. – Preference will be given to candidates under 30 years of age. – Priority will be given to candidates that have knowledge of English and Spanish and to those who have not participated previously in similar programs, in terms of content and objectives, in Spain.